Khabib Nurmagomedov is the current UFC Lightweight champion and a very dangerous fighter. But he has other great qualities too. “The Eagle” was in Jordan, where he took part in a shooting practice. In the video below, Khabib demonstrates his deadly gun firing skills. Nurmagomedov fires at the target while on the move. We cannot see Khabib’s final score but his hands look steady and he reloads like a commando! Khabib also spent time in a cancer center in Amman, the capital of Jordan. @TeamKhabib also visited the cancer center in #Amman. On Sunday, Khabib Nurmagomedov shared a photo from Jerusalem on his Instagram account. Khabib’s UFC career was brought to a halt after taking part in the infamous UFC 229 post-fight brawl. At the end of January, the undefeated Dagestani reached a settlement with NSAC, and he was slapped with a nine-month suspension and $500,000. NSAC offered “Eagle” to complete an anti-bullying PSA in exchange for a reduced six-month sentence. But Khabib Nurmagomedov nixed the proposal and trashed the state of Nevada for allowing gambling, drugs and prostitution. It seems Khabib won’t take part in an anti-bullying campaign. He’ll be eligible to return to the cage in summer 2019. But the UFC Lightweight king plans to stay outside of Octagon for a whole year, as a sign of solidarity with his teammates Zubaira Tukhugov and Abubakar Nurmagomedov, who received one-year suspensions by NSAC for their roles in UFC 229 post-fight riot. 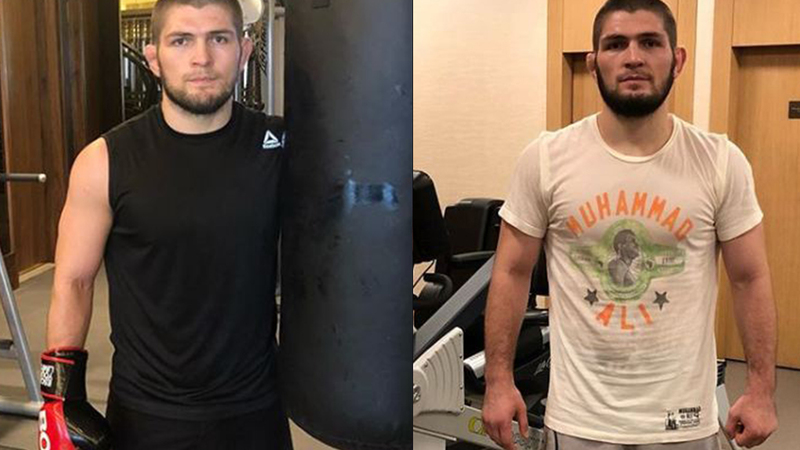 According to his manager Ali Abdelaziz, Khabib Nurmagomedov targets a UFC return in November 2019. Dana White is not impressed. He recently said that Conor McGregor might fight Tony Ferguson for Interim belt if Khabib remains sidelined until October. Did you like Khabib’s shooting skills? What do you think, when will Khabib Nurmagomedov step inside the Octagon again?